Never heard of screech owls! still, I expect your son wishes he hadn’t either, lol. 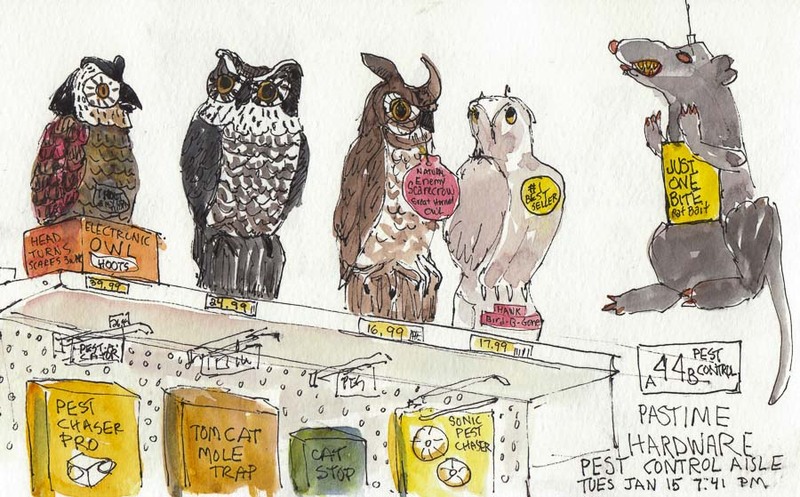 Love your drawing of the hardware shop ‘critters’. He was pretty upset by them. I Googled owls trying to see what they sound like and it was pretty awful–definitely not something you’d want to hear when trying to sleep. I used to have a neighborhood mockingbird that woke me up all night long–they’re such goofy birds and quite loud. The one in my current neighborhood is amazing–does car alarm sounds and frog noises as well as other birds but fortunately only in the daytime. Hardware stores are so much fun, although I haven’t seen one quite as dramatic as this. Wonderful drawing. We have screech buses on our urban street 🙂 and one coyote trying out all the dog and cat food in the neighborhood. I’m curious, do you get permission for the group to draw in these stores before you go? We don’t usually request permission unless it’s a small venue that we’re likely to overwhelm or we are asking them to stay open later for us. Surprisingly we have had quite a few places stay open just for us–one even served us cake and tea!